I've been using Fira Code as my new dev font. And I'm sticking with it. 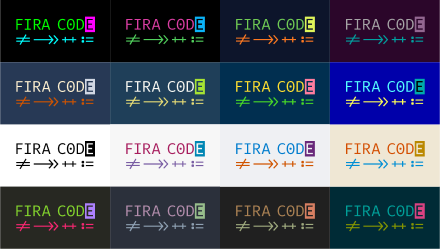 FiraCode is available on GitHub, and is a based on the concept of ligatures, targeting at programming symbols. In short, ligatures are where two or more actual characters are printed as a single printable character, originating in print where certain letters in certain orders would have a special stamp to use in the printing press to represent them. This gives a font a nicer flow and feel. Applying this concept to programming symbols, we get Fira Code. The name comes from the original font, Fira Mono. (A good mono font should be the basis of any programmers font based on today's most popular languages). And luckily installation into your favorite editor is simple. I will link to all the installation instructions but give you the simple gist of getting it working in Visual Studio Code. First you need to download and install. The download link (currently v1.204) is available on the README.md page of the repository and installation on Windows is as easy as opening the zip file, open each .ttf file in the ttf folder and clicking install. If Code was already open when you installed the fonts, you might see everything change to a font that isn't even mono-space. Just restart Code and the correct Fira Code font should take affect. The biggest difference is that you will notice as you add and remove symbols from symbol pairs the characters on screen will drift a little left and right to be closer, and in many cases the characters actually link up. These instructions are listed on GitHub as well. If you are not as bold as me, I still recommend checking out Consolas as a good mono-space developer font as standard. But I recommend trying Fira Code before ruling it out completely.